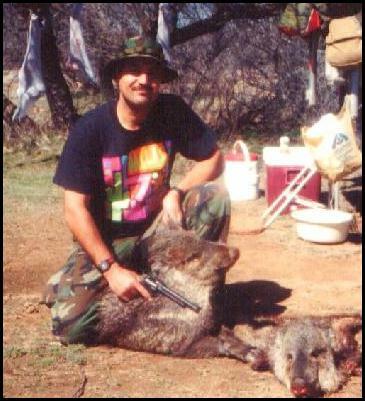 From all that I had heard and read, going after javelina with a rifle was just a little too easy. I was told that they are very stalkable, and that it's not too hard to get real close. Well, last year Brad Birdsell and Mike Hodge took me out to look for piggies during the archery season. Luckily for me, I didn't have to embarrass myself by demonstrating my archery skills, because we never ran across any pigs. So I 'fessed up to myself that if I really intended to get a piggy, I would have to do it with lead. My neighbor, Mark Snyder and a crew of his buddies did pretty well against the javelina last year during the HAM (Handgun, Archery, and Muzzleloader) season. I begged him to save a place for me on his application for the 1994 season. He had hunted unit 37B, and that was his plan again for this season. The season opened on Friday the 18th of February. He and his crew arrived on Thursday so that they could hunt the full day on the opener, but I arrived at noon on Friday. As I set up my camp and ate my lunch, they dragged back into camp from the west to eat lunch themselves. They reported that so far, there was no sign of piggies. I met the guys, we chatted, and finished lunch. The plan for the afternoon was to head to the northeast to the area where they scored last year. So we all piled into Rick's van and drove about four miles to the area. We had been out of the van for only five minutes or so, walking along the road, when Mark spotted them. There was a herd of about a dozen walking and grazing on a low ridgetop only about a half mile from us! We stood and watched them for about 20 minutes, planning our approach. Mark wanted to make sure that they wouldn't scent us as we moved toward them. We had three or four small ridges to cross before getting to them, though the piggies kept moving. As I slowly crested the final ridge, the herd came into view, with the hind end of a big one at a distance of only around 15 paces! I raised my Ruger Blackhawk as Rick raised his S&W .357 to my right. Rick waited for me to fire first and I did. After firing, I just stood there for a moment dumbfounded, as that piggy just kept eating. Huh? I regained my senses and raised my gun again. Other shots were going off all around me now as the other guys took their chance. I shot again, but now the pigs were flying everywhere! I chased mine down a draw, hoping that my second shot hit, and that I would soon see him wobble and fall over. I tried a running shot, but he kept flying. I heard Rick on the other side of a ridge, "Comin' at ya! Comin' at ya!" I turned and saw another biggy piggy barreling down towards me. Two more shots issued from my barrel, but he kept flying too! By the time the shootin' was over, two of the crew's five tags were filled. Rick scored with his first shot, a heart shot. Brent ended up chasing a wounded animal for about a mile before putting it down. The next morning, we were back at it. The guys had been using those Radio Shack headset walkie talkies. I had tried them a while back and was real disappointed in their performance. Noisy, and I lost contact with my wife before I got to the end of the block. I took them back and never thought about them again. But out here in the bush, the guys were routinely talking at distances of more than a half mile! With the radios we could split up and walk the ridgetops and really cover a lot of ground. When someone would spot the piggies we would all regroup to plan the assault. On that Saturday morning, we had pretty much scoured the area just to the southeast of camp by the time our stomachs began to tell us it was lunch time, and we had not seen a thing. So we took a break for the noontime meal. After lunch, we broke up into two groups to reconnoiter the area to the west of camp. We ended up going in further than they did on the previous day before I got there. About two-and-a-half hours after lunch, we got word over the radio that Brent had spotted a herd! Mark and I rushed over to join the other group. This herd was about a mile-and-a-half away on top of a high ridge. Trouble was that there was a lot of thick brush between us and them. It took a while, but we worked our way toward them. By the time we got there, they were no longer on the top of the ridge. Chances are that they were alerted by our movement through the brush. Roy and I finally spotted some in a heavily shadowed little draw from about 100 yards away. Roy was able to get within 25 yards before heavy brush blocked his way. I was about 50 yards out when Roy's Ruger auto opened fire. Now I'm no pistolero, so 50 yards is still a bit far for me to expect to hit anything under hunting conditions. But I figured it was the best shot I was going to get today, so I lobbed one over. No good. I saw them start to run, so I ran around to try to head them off, but the damn bush kept blocking me. Roy took off chasing after one. From two ridges and a half a mile away I heard what sounded like a war! When I caught up with Roy, I learned that he and Mark had taken down two juveniles. Roy had fired off nearly two whole magazines from his auto! After two days of hunting, four of the five tags had been filled, and you-know-who had yet to score. I awoke the next morning to find the guys cooking up an elaborate (for camping) breakfast of eggs, bacon, hash browns and pancakes. I, however, was anxious to get into the bush to fill my tag. I quickly downed a humble breakfast of cold cereal and headed off toward the west where we had gotten into piggies on Saturday. I understand that they live in a very small range and tend to regroup after being scattered, so I had high hopes of finding them again. Before I got out of camp, Roy offered to go out with me. So we grabbed a pair of radios and headed out. The two previous days were hunted under the effects of a cold front moving through. Wind, overcast, a little rain, and even some snow flurries. But on Saturday evening, the front moved out and the night was clear and cold. By ten thirty on Sunday morning there was enough sun that I was starting to sweat. By the time Roy and I reached the other two, they had confirmed that there was only one. We were at the top of a ridge overlooking a draw that was about 150 yards wide at the top and about 40 yards deep. The piggy was on the opposite slope, toward the bottom , about 20 feet upslope. The guys asked me how I wanted to approach him. Did I want them to deploy around the animal and move him toward me? No. I told them I wanted a clean stalk on a standing animal. As I moved downslope, I was quickly able to put a tree between myself and the pig. The tree was at the bottom of the draw on my slope. As I reached it, I realized that I would have to get down on my hands and knees to crawl underneath it to reach the pig. As I did so, the antenna on the headset started to foul in the branches, so I had to stop to remove the radio. When I emerged on the other side, I could not see the pig. Oh no. Did the antenna noise spook him? I cautiously raised my head to look. There he was! Hind end toward me. I continued crawling and watching him as I did so. When I was about 15 yards from him, he finally raised his head and turned toward me a bit, presenting me with a fine shot. I raised the Blackhawk and fired. His back end dropped out from under him and he started thrashing. I fired again, but missed. I walked up to him and finished him. I was met with cheers, backslapping, and congratulations as the boys joined me. Later, Mark told me that he had more fun watching the stalk, than he would have had were he the one stalking. He commented that the pressure of being the last one to score with all eyes watching would have been tough. Gee, thanks, Mark. You're right, but it didn't occur to me until you said so!